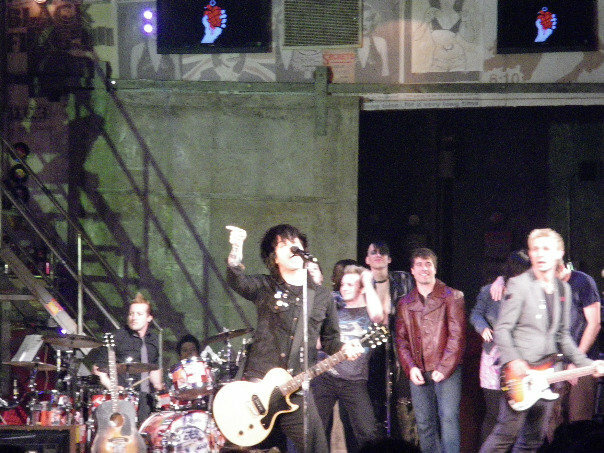 UPDATE: I mentioned yesterday the Amazon.com link to the American Idiot cast album, but I didn’t post the link to the site. I was trying to get this done fast so that I could head off to a fitting for a movie shoot that I was asked to do and then realized I couldn’t do the shoot because I couldn’t get off of work. The story of my life and acting. Oh well. Anyway, you can listen to excerpts of the songs as sung by the cast at the Amazon site. 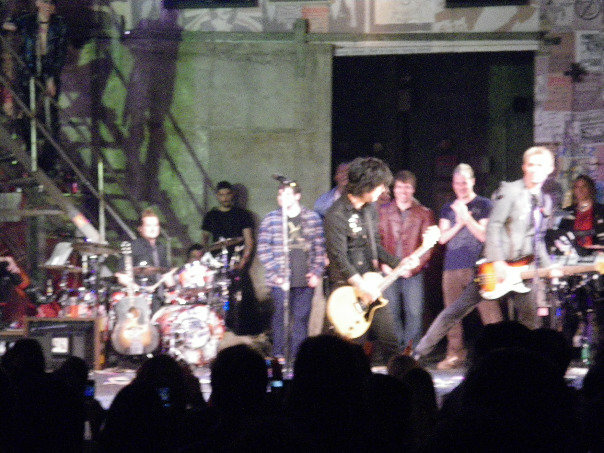 The album “features” Green Day and includes the never before recorded song, “When Its Time” sung by Billie Joe Armstrong. The caricature, a portrait of one’s physical features styled in an exaggerated manner, is an old art form and has a long history and tradition on Broadway. Actors, playwrights, producers, directors, choreographers, composers, and sometimes designers, get their own caricature portrait, usually epitomizing the person at a particular time or moment, in a show, on a set, etc. Sardi’s Restaurant, directly down the street from the St. James Theater on W. 44th, is legendary for its customers, who tend to be the movers and shakers of Broadway. The restaurant has a long tradition of hanging caricatures of its famous guests throughout the dining area and bar. Wikipedia says the rumored common thread among those hung in the place: they have all eaten in the restaurant. Now that’s marketing! 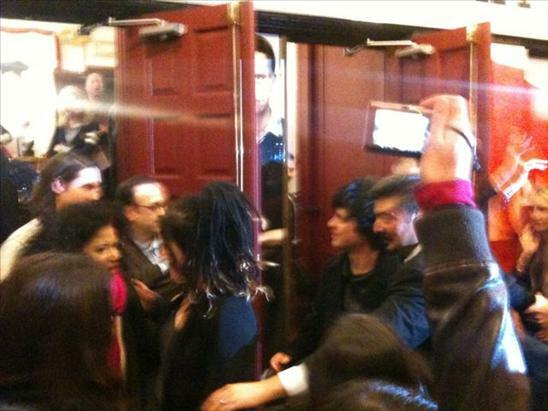 You may have heard about wild and crazy antics breaking out at Sardi’s after the first preview on 3/24. I’m sure that Sardi’s hasn’t seen that kind of action over a show since the 1950s. (See here – Vince Mediaa link – and here – GD fans ask Billie Joe to sign tattoo and go a little nuts outside of Sardi’s – for videos.) Maybe a portrait of this type will eventually make its way onto the walls of Sardi’s one of these days? Personally, I used to dream about having one at the famed restaurant as a kid. Though, I’ve only had drinks in the bar, I’ve never eaten there (but I’m pretty sure that I’m far from eligible anyway, lol). The caricature of Green Day is by the modern-day caricaturist, Ken Fallin as seen on the theatrical website, Broadway World. 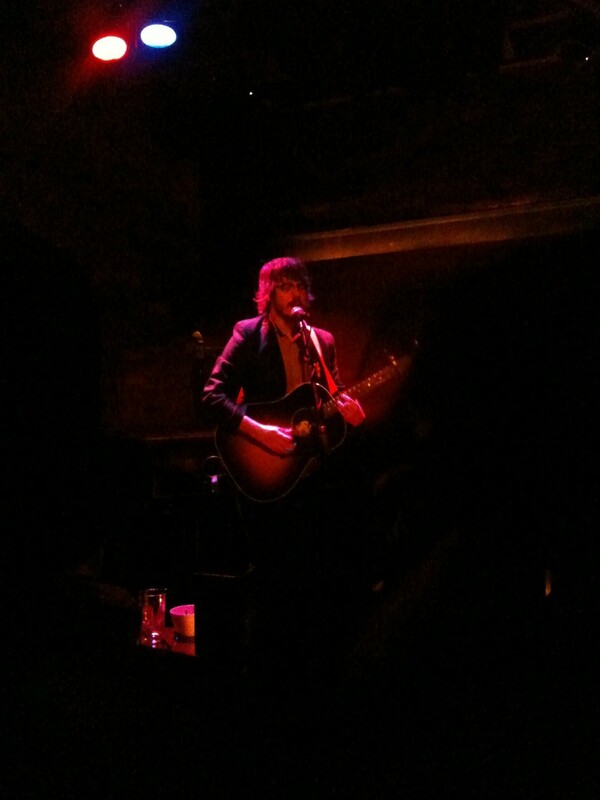 Thanks to Nicole for finding the photo. You may have heard of the artist, Al Hirschfeld. Hirschfeld was the premiere caricaturist of the Broadway theater for a good portion of the 20th century. A master of his craft of illustration, there’s a great Youtube video of him drawing another legend of the theater, Paul Newman, from a production of “Our Town.” Hirschfeld was 99 years old at the time. The drawing took eight hours, but not because of his age. You can take a look here. I’ve had the good fortune to see the show three times on Broadway now, including the first preview (a benefit of living in the Greatest City on Earth, New York). I am pleased to report that I am thrilled with the production. During its run in Berkeley, I had some constructive criticisms of the show, and it was difficult to have a differing view from other die-hard fans. I’m a grouchy and jaded, NYC theater goer, so I’ll get over it. As far as I was concerned, the Berkeley run wasn’t meant to be polished. It was meant to be criticized and pulled apart and put back together again in order to make the show even more fantastic when, and if, it got to its destination. Afterall, that’s what a trial run of a Broadway show is all about. 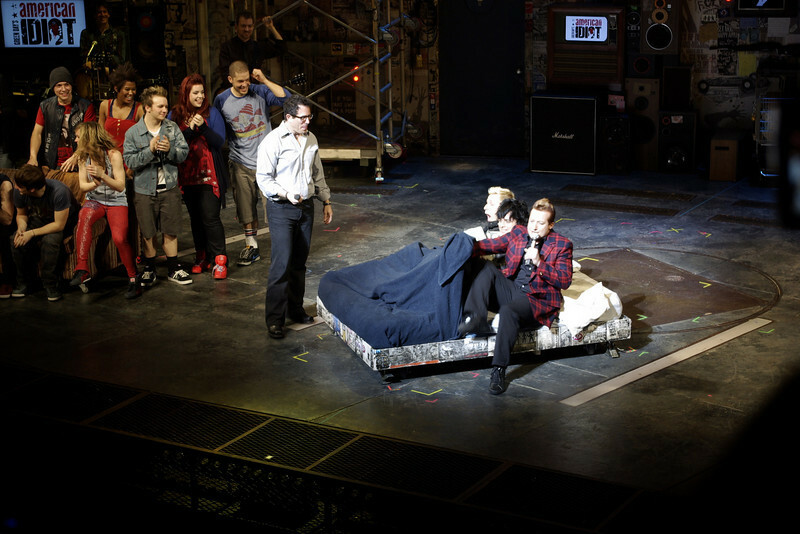 American Idiot is now in previews at the St. James Theater and ends this coming 4/19. When the show opens on 4/20, it will be set, and it will be perfect. 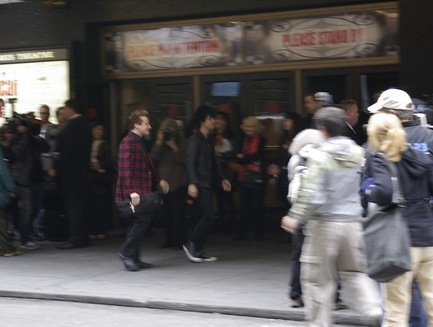 I was able to buy a ticket to the show on 4/20 — International Pot Day — otherwise known as the Broadway opening of Green Day’s American Idiot. As they do in the theater, I’m going to wait to offer my review of the show until it officially opens. I’ll be in the balcony that night, along with a bunch of other Idiots. I will say that I am happy and quite pleased with the work done on the show. It shows more depth and feeling all around. Bravo! 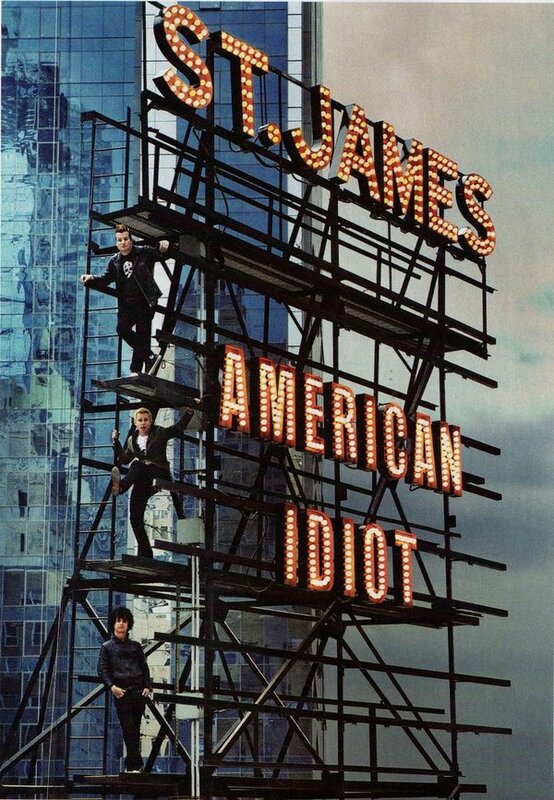 Night View, American Idiot on Broadway Billboard. Photo by Tanya Elder. Though Mayer added little dialogue to Armstrong’s often impressionistic lyrics, he hopes that by sharing words among a dozen performers, he’s created a kind of found-text libretto for a multi-pronged narrative that entwines city, suburb and battlefield. I have read others say that the story is “weak,” but I’ve always maintained that the story was adequately served (see my Book overview here) not only by the album’s lyrics, but also by the liner note-type “monologues” that appear in the few special editions of the album version released when American Idiot (see scans of the liner notes here) first came out and I stick to that. It certainly is a “soundtrack to a life” script or even a “portrait/snapshot of life” and I think that Mayer and Armstrong successfully found a way to make the lyrics and music stand out, combined with aspects of video, spoken word, captions, images, all coming together to present a visual sense of what it feels like to head toward a mental blow-out — as the mover of the story’s narrative arc. “Found-text libretto” is a good way to describe the mechanics of American Idiot‘s underlying book — a snapshot of memory affecting everyday life. It’s the most experimental feature of the show, and I like its hazy memory quality. Each piece of “found text” throughout the show contributes to the story. A few weeks ago, I mentioned that Mike Chickenman, Nicole Gary and I (as well as 12-year-old Ethan Udell, who I don’t know), appeared in a feature article on the show in the New York Daily News. I’m happy to say that both Greenday.com and Greendayauthority.com posted the scans on their sites! The three of us had a slight “21st century breakdown” when we saw it on the official site on 4/3. We all swooned a bit. 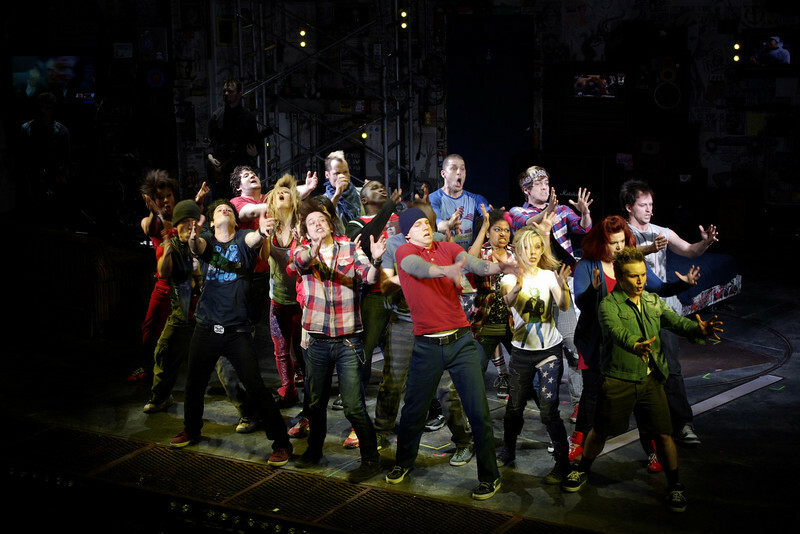 If you haven’t been visiting American Idiot on Broadway’s Facebook or Main page, I suggest you do it you are interested in the show, opinions about the show, contests, and fan- and newsbuzz. While the FB site got off to a slow start, they have started posting up some great stuff, including Youtube videos of a backstage view of the theater with actor Ben Thompson, and the assistant director Austin Regan talks with guitarist Alex Berlin. (Thanks to Grassmah Girl for the correction!) The site also had an awesome contest for SUPERFANS to attend opening night, and tweet about the show from the show and attend the After Party. I didn’t enter the contest, and there are five or six Youtubes videos that I think are fantastic, three of which are terrific. There is one in particular that I have in mind that I hope wins, but I’m not gonna say what my favorites are until the winner is announced. Good luck to everyone who entered! The Tony Award nominations are coming up on June 13th, and as I’ve noted before, Green Day’s European-tour leg, which kicks off May 29th (so far, at least, and it will be GREAT to have the band back on the road again), has a built-in break around Tony time. Unless some concert in Europe is going to pop up, which I doubt, Green Day will be flying from Austria to New York to Manchester (maybe?) because buzz has American Idiot winning Best Musical of the 2009-2010 Tony Season. We’ll see. First of all, before that pans out, the Tony Committee has to meet in order to haggle over which shows are eligible for what categories for this season. Here’s an interesting article on who is allowed to vote this year. It also talks about American Idiot‘s biggest competition, “Fela!” The fellow who is predicting that American Idiot will win for Best Musical and Enron for Best Play will be nominated/win in their respective categories has some interesting things to say about “Fela!” that I had not considered before. Thanks to Justin for finding the article. 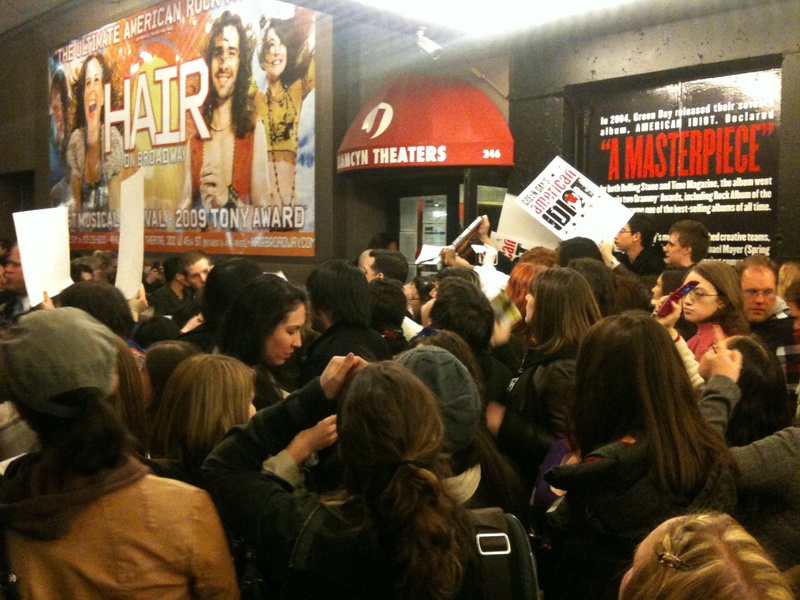 This article from Playbill.com is a must read and listen-to. Michael Mayer interviews Billie Joe Armstrong about American Idiot, and talks about what happened at the Grammy After Partys. This interview that appeared on the LOGO Network cracked me up. It’s from LOGO’s Drama Club. I think it was the music. And Tre’s favorite, The Drowsy Chaparone was a good show that I wish I had seen. Oh well. 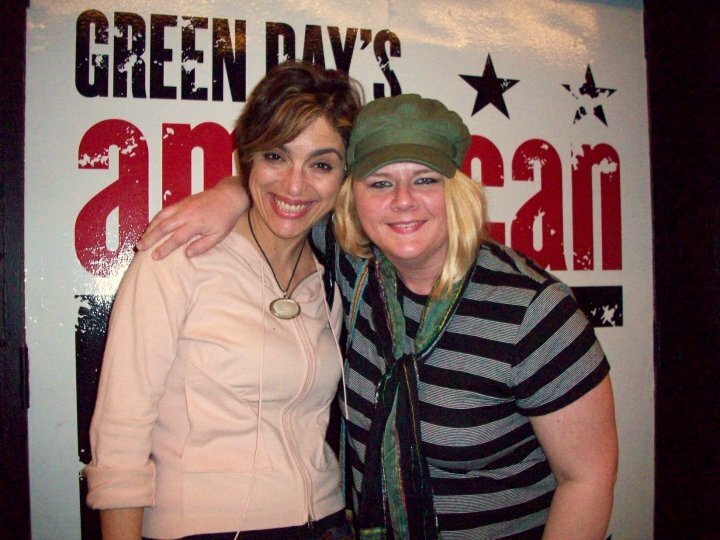 My friend Diane is auctioning off two tickets to the final preview of American Idiot on 4/19. 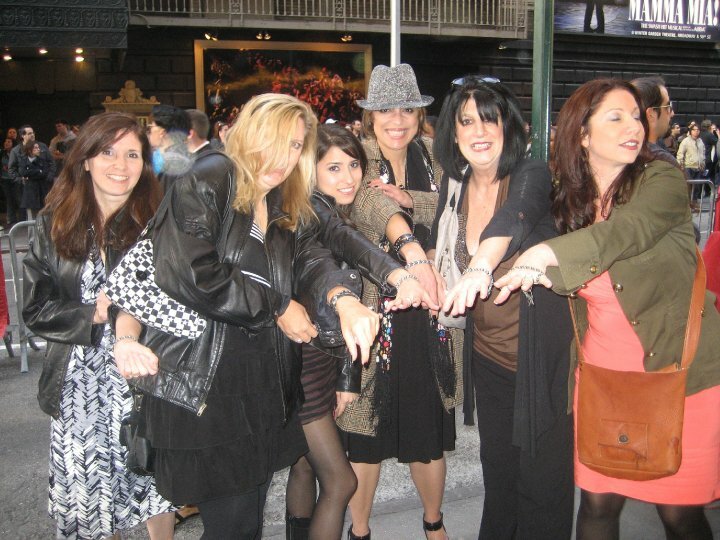 Diane was to travel to New York with her friend to see the show. 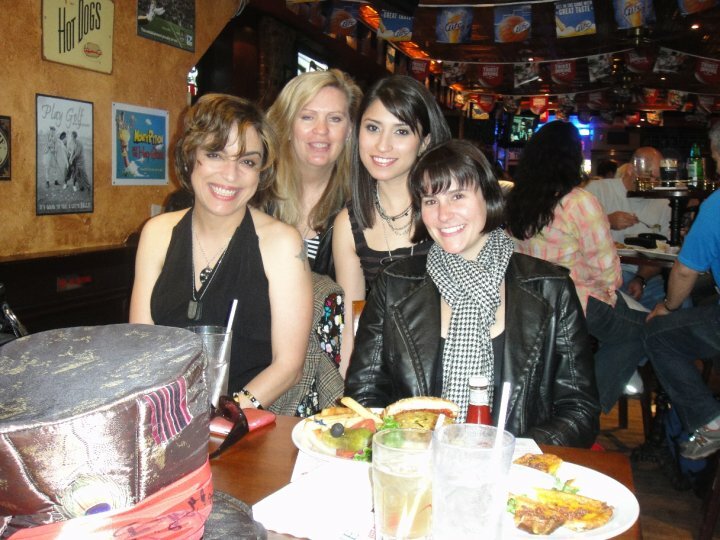 Unfortunately her friend has breast cancer and will be unable to come to New York at this time. Diane and her community of friends in the Northwest are helping as her friend goes through cancer treatment, so she is also unable to attend the show that night. I was fortunate to see the first preview of the B’way version of AI with Diane. I’m glad you got to come and see the first preview and all the best with your friend! All proceeds from the auction go to her friend’s cancer treatment fund. She does not have health insurance. 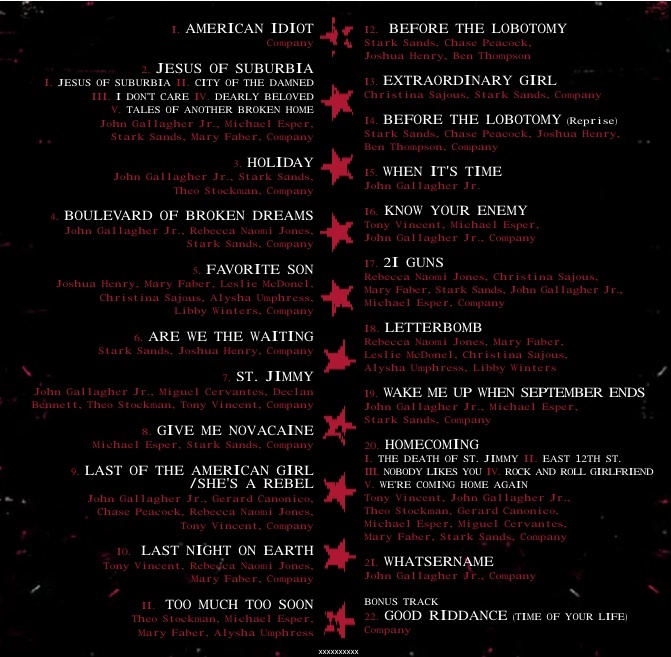 I posted last time about the back cover of the American Idiot Original Cast Recording. Green Day’s Facebook and site posted the front cover this past week, and again, thanks to Justin, Amazon.com says that the album will drop on 4/20. You can also pre-order until then, a copy at the theater. Just fill out a form and pay at the time. 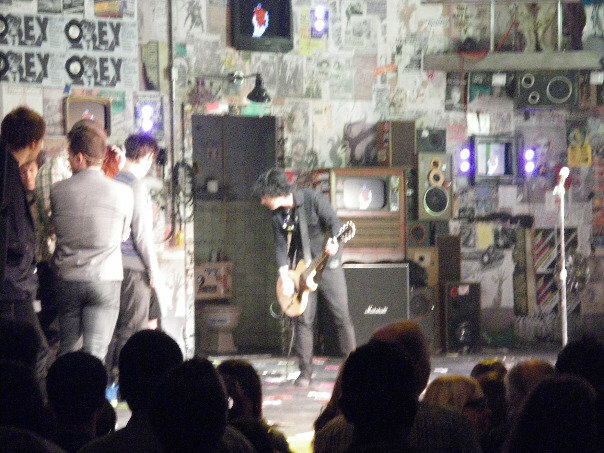 (h/t plaidducky) Lastly in the American Idiot on Broadway realm, MTV and Green Day have combined together to present many “Buzzworthy” presentations of AI on Bway. MTV’s offices look down from Broadway onto 44th street where the St. James Theater is located, according to MTV’s twitter. Whatever one may say about corporate blahdeblah, I gotta say, this is an excellent move on MTV’s part. MTV is giving away tickets to a “Special Performance” of the show for April 22nd. I have no idea what this entails, by being special… but I’m going to the show that night as well. Hmm. Whatever could “special” and MTV mean? Double hmmmm. You can enter the contest here. And with that, I’m off! Don’t forget coming up, Billie Joe on Bill Maher (last night, 4/9), and the Jimmy Fallon show is being taped here in NYC on 4/14. Later! See the cast album cover after the jump.